In a chamber at the New York City Bar Association in midtown, members of the New York State Commission on Legislative, Judicial, & Executive Compensation met on Tuesday to discuss recommendations on increasing salaries for members of the state Senate and Assembly and state agency heads and commissioners. It was the last public meeting of the commission, which was under a November 15 deadline to make its recommendations as mandated under the April 2015 statute that create it. But the six members of the committee who were present could not find common ground and the meeting devolved into significant disagreement about the role of the commission and whether it should even take a vote on the one set of recommendations put forward. A vote was taken on whether pay should be increased by about 2 percent per year since the last increases, in 1999, and resulted in two yays and three abstentions among the five voting-eligible panelists. There was even a dispute over whether commissioners could simply not vote or if they were considered abstaining from the vote by doing so. It was the two commissioners appointed by Governor Andrew Cuomo who refused to record any vote at all while the chair was not given a vote under the statute establishing the commission. The two appointees by legislative leaders voted in favor of raises, and the representative of the judicial branch abstained. The executive appointees, Fran Reiter and Robert Megna, said they would not approve any raises unless they were accompanied by substantive ethics reform in Albany, particularly a severe limit on the outside income of legislators. (Megna was recently appointed by the governor after another appointee, Gary Johnson, resigned from the commission. The third executive appointee, Mitra Hormozi, was out of the country, the chair said.) Reiter said the commission should not vote on any proposal and stay open in the hopes of lawmakers convening a special session in Albany to vote through such outside income limits. Commissioners also took issue with the fact that members of the state Legislature did not appear before the commission to make their case for a raise and to answer the commission’s questions. The legislative appointees, on the other hand, argued that the commission was charged with making an independent decision that should not be unduly politicized, expressing disappointment that the executive appointees were effectively parroting Governor Cuomo’s position to force reform. That the vote would fail was made clear right at the start of the hearing by Reiter, who began by saying that the executive appointees would refuse to vote on any proposal increasing pay for state legislators, while generally agreeing that employees of the executive, such as agency heads, deserved much needed pay raises. She insisted that legislators should first establish a cap on outside income, essentially making their jobs full-time, and follow the lead of other elected bodies that have done so including the United States Congress and the New York City Council. “It is unfortunate that the good legislators who work full-time, ably and honestly represent their constituents and most assuredly deserve a raise will suffer because there is refusal to right systemic wrongs,” Reiter said. Insisting that pay raises for the Legislature -- where the base annual salary has been $79,500 since 1999 -- are necessary to attract “good people” to state government, Hedges instead proposed a 2.154 percent per year cost-of-living increase across the board, even suggesting that it include the Governor and Lieutenant Governor, positions outside the commission’s jurisdiction. “It doesn’t change the relative status of anyone...it doesn’t change the balance of power,” he said. “The balance of power is part of the question and it needs to be incorporated in whatever it is we recommend.” Hedges’ proposal, which would raise salaries for state legislators from $79,500 to roughly $114,500, was later voted on but failed to garner the necessary majority. Reiter and Megna were visibly exasperated as Hedges spoke. Reiter sighed deeply, threw her hands up from time to time and audibly scoffed when Hedges said, “I think it’s awful that the governor wants to be King. I think it’s awful that the governor’s representatives here think that he should be King.” Reiter later hit back at Hedges’ for questioning her independence. “I reject that notion and frankly, I’m insulted by it,” she said, announcing that she had not spoken to the governor since well before being named to the panel. Hedges found support from James Lack, who was appointed by Senate Majority Leader John Flanagan. “I think [the percentages are] certainly fair and represent only an inflationary increase brought about of course by the political impossibility of having to vote for an increase yourself,” Lack said. The commission members also debated whether they could effectively continue their work after Tuesday, without a statutory mandate. Reiter posited that if they were to adjourn without putting any proposal to a vote, it would afford the state Legislature time to pass the reforms she was demanding before the end of the year and the commission could reconvene to move ahead with raises. 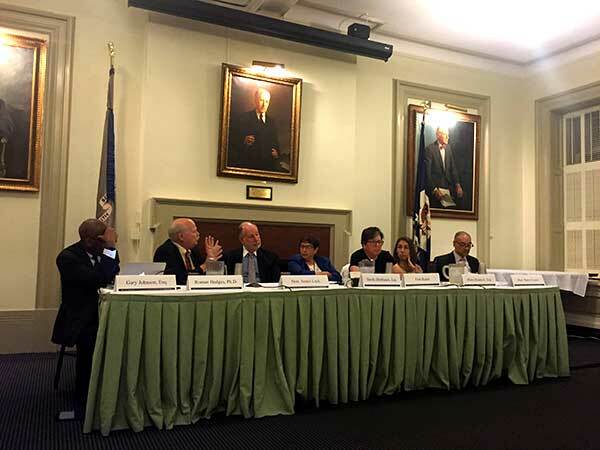 But judicial appointees Barry Cozier and Chair Sheila Birnbaum both disagreed, as did Lack, saying that the commission would no longer have statutory authority and would have to be reauthorized by the state Legislature. Megna released a statement hours after the panel adjourned, saying that he believes the commission can still act before the end of the year and that he hopes the Legislature will enact outside income limits so that he and the commission will feel justified to vote through significant raises. He also said that he was open to small raises without such reform. According to the 2015 law creating the commission, its recommendations would become law for the new year unless voted down by the Legislature. A commission is set to convene every four years according to the law, which sought to put the Legislature and Governor at some distance from ostensibly giving themselves pay raises. Cuomo is in favor of raises, but has argued for months that lawmakers should also cap outside income. Heastie made the argument in October that legislators deserve a pay raise and his chamber has been open to some cap on outside income. Senate Republicans have refused to consider any cap, citing the importance of a part-time Legislature and the ability for legislators to hold other jobs. The New York City Council recently passed pay increases for its members and citywide elected officials, while banning outside income and declaring the Council member position full-time. The New York State Commission on Legislative, Judicial, & Executive Compensation is at the center of the issue and an ongoing legal battle over the validity of the process it was put in charge of through 2015 legislation. Created as part of the April 2015 budget package, the commission is charged with making recommendations for salaries for the legislative, judicial, and executive branches of state government. The recommendations are due Tuesday, November 15, and will become law for the new year, when the next, largely unchanged class of state legislators takes office, unless they are modified or voted down by the current Legislature. Raises for state legislators -- state Senators and Assembly members currently make a base salary of $79,500 -- would be the first since 1999. But the nature of this process has been questioned, with disagreement over whether this method of increasing salaries is allowed under the New York State Constitution because of the delegation of such power to the commission, which the law states will now convene every four years. Coll sued the commission, Gov. Cuomo, and the state Legislature. His arguments were dismissed in New York State Supreme Court in Nassau County, but he has appealed to the Appellate Division of the New York Supreme Court. On behalf of the defendants, Attorney General Eric Schneiderman’s Motion to Dismiss argued against Coll on two grounds. First, the motion argued that Coll’s “deep concern” does not provide him the standing to sue. In the motion’s eyes, “standing to sue requires the plaintiff to allege not only that he has an injury in fact that is distinct from any injury of the general public, but also, that he is within the zone of interests protected by the statute or constitutional provision at issue.” Furthermore, as the motion says that Coll’s injury is “identical to any alleged injury suffered by the general public, as well as speculative,” Coll’s “deep concern” did not provide him adequate standing to sue. Second, the motion concluded that the commission is constitutional, on multiple grounds: that Coll did not prove the unconstitutionality of the commission beyond a reasonable doubt, that this commission was not an improper delegation of legislative authority, that the provisions cited by Coll “do not support his contentions,” and that “other states’ similar compensation statutes have been upheld” by the United States Supreme Court. As Coll appeals, government officials dismiss the validity of his case, but other experts think that he raises some very important questions on the constitutionality of the pay commission. “I think it’s an intriguing argument. It could go either way. And I think a close reading of the constitution with specific provisions could lead you to a conclusion that an affirmative vote is needed,” said Gerald Benjamin, a dean and political scientist at SUNY-New Paltz, hitting on one key aspect of the pay commission’s larger structure: that its recommendations become law unless voted down. “But the courts have been respectful of the Legislature, so it’s hard to predict how the Court of Appeals will ultimately decide on this,” Benjamin said. Provisions of the New York State Constitution, like Article 3, Sections 13 and 14, outlining how laws should be enacted and how bills should be passed, and Article 7, Section 7, outlining when money can’t “be paid out of the state treasury or any of its funds,” could, in Benjamin’s opinion, be interpreted in a way that puts the constitutionality of the commission into doubt. 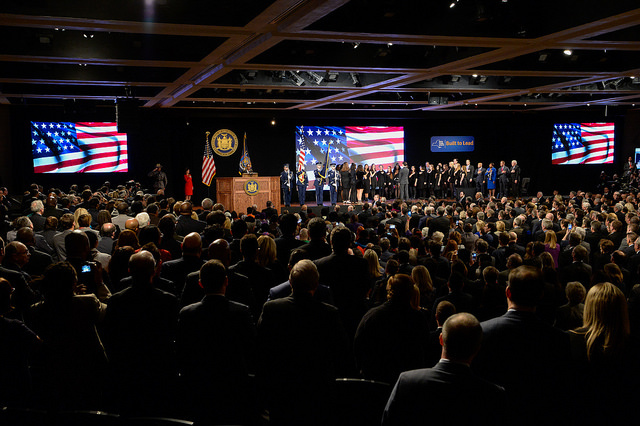 The commission was created as part of the budget agreement among Governor Andrew Cuomo, a Democrat, and the leaders of the state Senate, which is controlled by Republicans, and the state Assembly, which has a Democratic majority. The commission has met five times publicly this year to hear testimony and discuss its jurisdiction and factors into its recommendations, and it will meet once more on November 15th, the day recommendations are due. The commission has seen public infighting and canceled meetings, and it has been the subject of squabbling between Cuomo and legislative leaders. 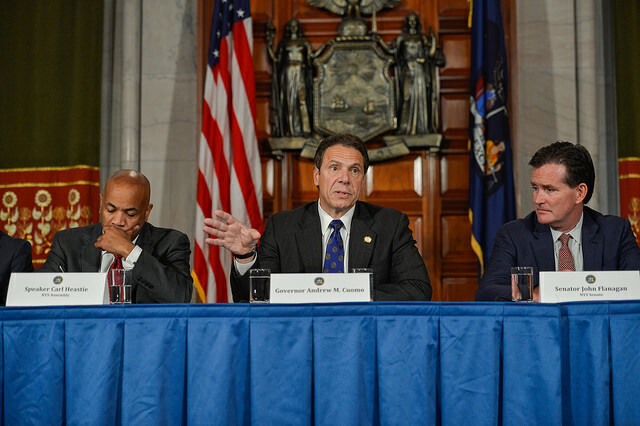 Cuomo made multiple comments tying the commission’s recommendations to the Legislature taking certain actions, including on timely budgets and campaign finance reform, and indicating that he believes pay raises should be accompanied by government ethics reforms. Cuomo wants to see a limit or ban on legislators’ outside income, which is currently unlimited. Neither Heastie’s office nor the office of Senate Majority Leader John Flanagan returned requests for comment for this story. Both Coll and Benjamin disapprove of Heastie’s desire to remove politics, and therefore the people who elect lawmakers, from the decision-making process. Coll believes that this removal of elected officials from the decision-making is unconstitutional. The commission's recommendations are due in a little over four months, on Nov. 15, and Tuesday’s meeting was nearly called to an end without addressing legislators' pay at all, save for a remark by one commissioner. The commission agreed to discuss the controversial issue of Assembly member and Senator pay, which has gone unchanged since 1999, during the next meeting, on July 26. Tuesday's public meeting was an open discussion among commissioners that did not allow for any public testimony, and there will be no additional public hearings before the deadline. The Compensation Commission set a tentative window for the top-earning agency commissioners’ annual salaries at somewhere between $175,000 and $200,000. These salaries have gone unchanged for the past 18 years - top-earning commissioners, like the head of the Department of Transportation, currently earn about $136,000 annually. There was no vote on the matter, though, as the commission still needs to determine the exact number they will recommend, which they are likely to do when they meet at the end of July. Conversations about whether or not to phase in the salary increase are also ongoing. As newly required by law, every four years - beginning June 2015 - the New York State Commission on Legislative, Judicial, and Executive Compensation is established to examine the compensation of state judges, legislators, statewide elected officials, and certain state officers. The commission is made up of seven commissioners - three appointed by the Governor, one by the Senate Majority Leader, one by the Assembly Speaker, and two by the Chief Judge of the Court of Appeals. The commission must make its recommendations before November 15, 2016. The commission’s recommendations will automatically become law and go into effect on January 1, 2017, unless the Legislature specifically votes against the increases. Tuesday’s meeting mainly examined compensation for members of the executive branch. Yet the salaries of the Governor and other statewide elected officials (which also have not been raised since 1999) went unaddressed during this meeting, and has not been thoroughly examined during past meetings or hearings. The commissioners seem generally confused as to whether they have the authority to recommend salary changes for the Governor and other statewide elected officials, like the Comptroller and the Attorney General, and questioned that while speaking amongst themselves before the meeting began. The commission released its recommendations for the judiciary in December 2015, which included salary increases for judges phased in over a four-year period. The compensation of state legislators, members of the Assembly and the Senate, who have not received a raise to their base salary of $79,500 since 1999, will be addressed at the next meeting. The subject was briefly raised, but the conversation turned tense and the meeting was adjourned shortly thereafter with little, if any, progress made on the issue. The salaries in the executive branch dominated Tuesday’s discussion, with commissioners agreeing to set a “tentative window” for the salary of the so-called “A-level” commissioners (meaning those who currently have the highest compensation). The commission eventually landed on the $175,000-$200,000 window, and agreed to adjust the compensation of the lower-earning top agency officials proportional to the adjustment for top-earning commissioners. “This shouldn’t simply be an inflation adjustment,” said commissioner Roman B. Hedges, former professor of political science and former deputy secretary of the state Assembly Committee on Ways and Means. The inflation adjustment for top-earning commissioners would be an increase of about 43 percent (to about $193,000) as their salaries have not been adjusted for almost two decades. “We should be thinking about how we can make this a compensation” that the commissioners deserve and that can attract the best people to public service, Hedges added. Sheila Birnbaum, chair of the pay commission and co-head of the Global Products Liability and Mass Torts practice at Quinn Emanuel Urquhart & Sullivan, suggested that the increase should raise the salaries of top-earning commissioners to somewhere “not as high as [comparable] New York City commissioners, but maybe at least somewhere between” that and the inflation adjustment. Many top-earning New York City commissioners earn about $220,000 annually. “There’s a certain symbol in the $200,000 number,” Hedges said, “It’s still below what the judges are making, it’s still below what the city commissioners are making, and it’s more than inflation…we want to make sure that our executive agencies are staffed with people who can handle the breadth” of managing complex agencies. “I understand the spirit of Hedge’s suggestion…but by my calculation that would be something like 47 percent,” said commissioner Gary Johnson, executive legal counsel at Medgar Evers College and former director of the Governor’s Office of Employee Relations. Johnson added that that sort of an increase might be politically unsavory. “That will be incredibly difficult to sell,” said commissioner Fran Reiter, a former executive deputy director for State Operations under Governor Andrew Cuomo. “I personally feel that we should not be looking at a number under $195 for the A group,” Cozier added. Reiter said she was “not comfortable” with that number, and called on the commission to be “realistic,” suggesting a range of $175,000-$180,000. “What we do here is ultimately going to be judged by the Legislature, who can negate what we do…and since we haven’t even begun to talk about what will be the most controversial issues that we face…we may very well come up with a number [for commissioners] that the Legislature is not going to be acceptive of if we don’t do the same for them,” Reiter cautioned. The commissioners then agreed to “come up with a number for the A-level commissioners that would then be proportionally applied to the other commissioners,” in Johnson’s words, and decided to address whether the pay increase should be phased in over time or given all at once at the next meeting. In the few minutes the “most controversial” issue of legislative compensation was discussed, the conversation quickly became heated. Legislators earn $79,500 and haven’t had a raise in 17 years, but can earn unlimited outside income because the position is considered part-time. State lawmakers’ outside jobs have been the subject of heightened controversy in recent years, especially as former Assembly Speaker Sheldon Silver was convicted on several federal corruption charges last year after trading official favors to pocket nearly $4 million in legal fees. Government reform advocates and Governor Cuomo have proposed significant limits on legislators’ outside pay while calling for their base salaries to increase dramatically in an attempt to limit corruption in state government. On Tuesday, two commissioners (Reiter, appointed by Cuomo, and James Lack, a former state Senator appointed to the Commission by Senate Majority Leader John Flanagan) repeatedly cut each other off to shout at one another over the relevance of state lawmakers being classified as part-time or full-time. Reiter responded that the “reluctance of the state Legislature to make its own case pisses me off.” (Government reform advocates have repeatedly expressed that the commission should be as independent as possible and should not allow those whose salaries they are tasked with determining sway their opinion). “Sorry if you don’t get that,” Reiter added. Tensions will likely remain high when the commission returns to discuss legislative pay on July 26. The meeting was adjourned almost immediately after the heated disagreement between Reiter and Lack. “We all knew that when we got to talking about the Legislature it’d get a little more heated - but we don’t have to get the heat this high!” said Birnbaum. Leaders from government reform groups have testified at two of the commission’s prior public hearings, and agreed that the current salaries for state legislators are insufficient, but urged the commission to take into account the “stunning series of seemingly unending scandals” coming out of Albany, as Blair Horner, executive director of the New York Public Interest Research Group, put it. Both the commission and advocates agree that, having not received a salary increase since 1999, legislators ought to receive one, and that doing so could help attract strong candidates to public service. Yet, advocates also warned that the actual amount that legislators earn is more than their base salary, since lawmakers can also earn leadership stipends, per diems, and outside income given the “part-time” nature of the job. Speaking amongst themselves before the meeting began, the commissioners seemed unclear as to whether or not they had the authority to recommend reforms to the way legislators are compensated. “I’m not sure if lulus are part of the conversation,” said Hedges, referring to leadership stipends. “I think that’s an important thing to confirm,” Reiter responded. This is supposed to be a “basic salary change…that’s what the senators told me - now that’s just their interpretation of what it is that they passed,” Lack said of legislators and their legislation creating the commission. The law passed last year did not grant the commission authority to make changes on reforms like limiting outside employment of elected officials, according to Horner. If the Legislature does not convene and specifically vote against the commission’s recommendations, the new salary levels will go into effect on Jan. 1, 2017. This will be for the new class of legislators chosen through November’s elections, many of whom will be the same individuals who currently hold the posts. There are no term limits in the state Legislature. During next November’s general election, in 2017, voters will decide whether to call a Constitutional Convention. If called, the convention would convene in April, 2019, and could address whether the job of a state lawmaker should be changed to full-time, among many other issues that may be on the table.